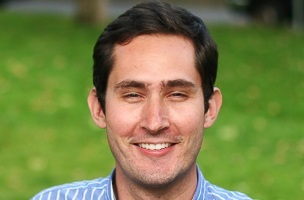 Instagram co-founder and CEO Kevin Systrom is the newest member of the board of directors at Walmart, the retail giant announced Monday. Walmart said Systrom is the 15th member of its board, and he will serve on its technology and e-commerce committee and its compensation, nominating and governance committee. Upon his appointment to the board, Mr. Systrom became entitled to a prorated portion of the non-management-directors’ compensation for the term ending on the date of Walmart’s 2015 annual shareholders’ meeting. The components of Walmart’s non-management-director compensation were disclosed in Walmart’s proxy statement dated April 23, 2014, relating to the annual shareholders’ meeting held June 6, 2014. As part of his non-management-director compensation, on Sept. 26, 2014, Mr. Systrom received a prorated stock award in the amount of 1,586 shares of Walmart common stock. Mr. Systrom will also receive a prorated portion of the $75,000 annual retainer payable to non-management directors, as well as a prorated portion of the additional $15,000 annual retainer payable to non-management directors who serve on more than one standing committee of the board. These annual retainers will be paid quarterly in arrears through the 2015 annual shareholders’ meeting, and Mr. Systrom may elect to receive these retainers in cash or Walmart common stock, defer in stock units, defer in an interest bearing account or receive in any combination thereof. Walmart has had a profound impact as a global leader in retail. It’s an honor to join the Walmart board and have an opportunity to help provide more convenient and flexible ways for people to shop. Kevin’s entrepreneurial background and his technical and digital expertise will be invaluable as we further connect with customers and deploy new capabilities through e-commerce and mobile channels. Walmart is investing in e-commerce capabilities through talent, technology and fulfillment. Kevin’s passion and deep knowledge of social media align with our focus to engage customers through our digital and physical channels.